Experiencing adversity in your childhood home can make you more compassionate than most. It can make you a more compassionate adult, because if you experienced suffering, you understand suffering. And deep down you want to take the pain away. Not cause more. This is the essence of compassion. But in order to fully and consistently tap into your true compassionate self, you must FIRST have compassion for yourself. 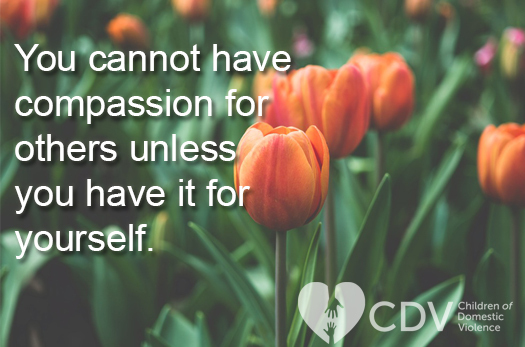 What does it mean to have compassion for yourself? If you experienced adversity in your childhood home, you experienced an injustice. Has anyone ever told you that? Have you told yourself that? Are you aware of the impact that it can have on a life? To have compassion for yourself means that you have taken the time to acknowledge the injustice you faced, to become aware of it, to understand it and to share these thoughts with another. It doesn't mean that you should mire in it and use the challenges you faced in childhood as the reason why you "can't" as an adult -- as the reason why you can't have the type of life that you truly desire. I wrote about a young woman who experienced adversity in childhood, and she said it best: "Because of the adversity I faced in childhood... there's nothing I can't do!" But if that is true, why do I still root for people to fail? If you don't have compassion for yourself, you may often find yourself feeling RESENTFUL towards others. Silently rooting for others to fail or hoping deep down that good things won't come their way. But that's not who you are. That is just how you feel in the moment. This begins to change when you choose to take the time to have compassion for yourself. And there's no better way to demonstrate this than through the story of Marina, a young woman who overcame the bitter resentment she harbored towards the childhood adversities she faced, replacing it with compassion. This eventually led her to adopt a mindset of "assuming positive intent" when interacting with and thinking of others. It is next to impossible for a person to be happy when they still harbor resentment. Marina's story shows that the LIE of resentment learned after one experiences adversity in their childhood home can hold you hostage and become a vicious cycle, inherited across generations. But Marina came to realize her feeling of resentment was just that -- a feeling. She came to understand that, as someone who experienced adversities, she was a person of compassion -- and that compassion led her towards the life of happiness and personal fulfillment she deserved. The first few years of Marina's life in rural Argentina were in many ways ideal. Her early childhood was full of laughter, family feasts, warmth and security. Her mother, grandparents, uncles, aunts and cousins played together, ate together, protected each other, and cherished the presence of this bright-eyed, inquisitive little girl. They taught her everything she needed to know about familial love. They were so close, she even shared a bed with her grandmother, who along with a beloved uncle, helped raise her while her mother was away at work. Marina's dad, Raoul, had left just months after she was born to seek his fortune in America. Her parents hadn't known each other very long, and Marina wasn't planned. They got married because "in a small town in Latin America, that's what you did when you got pregnant." But her dad decided it was best to try his luck in the land of opportunity. His own family was poor and uneducated, so he was determined to prove his worth and show everyone that he was somebody to be reckoned with. By the time Marina turned 6, her mother wrote to her father and asked for a divorce (one of the 10 adversities that you can experience in your childhood home). It seemed obvious he was never going to be a part of the family picture back in Argentina, so it was time to make that official. Marina's dad pleaded with her mother to come to the United States and bring Marina. He told her he was ready to provide a comfortable life for his wife and daughter, and wanted to try to be a family. Marina's mom decided it would be unfair to her daughter if she didn't give her a chance to get to know her birth father, so she agreed. "She didn't want to have me grow up without a father and have me ask about him later in life," Marina explains. "She didn't want me to live without that experience and regret it later." By this time, Marina's mom didn't feel much for the man, but at least, she thought, he was trying to do the right thing by his family. An education in America for their daughter would be an added bonus. Marina's father had fulfilled his ambition and became a success, establishing a thriving catering business in the Northeast. It should have been a fresh start, filled with promise. Instead, it was the beginning of a joyless upbringing full of emotional abuse that bred sadness, bitterness, and resentment. He resented his wife and daughter for having a "better life"
Marina's father experienced adversity in childhood as well. He never learned to have compassion for himself. So as an adult, he didn't have compassion for anyone else. He wasn't physically violent toward his family (he prided himself on never laying a hand on them), and he reminded them of this fact often, as if Marina and her mother should consider themselves lucky that they weren't being hit. However, his words and other actions were purposely chosen to cause pain in another way. Although he considered himself superior to his own father because he wasn't physically abusive, his put-downs and reprimands were as constant as they were harsh. It was as if he resented his wife and daughter for having a "better life" than he had had himself. If you came to resent one or more adults in your household, perhaps you too can now look deeper and see how their behavior may have been the result of inheriting resentment in their own lives. The greater gift of this awareness is to know that you are someone of great compassion and that you can overcome the feelings of resentment and end the vicious cycle. Resentment flows in many directions, as we can see here. Had Marina's father learned that he must take the time to have compassion for himself, he could have shown compassion to his wife and child, rather than resenting them for suffering less than he had suffered. He could have broken the cycle of suffering. This is the origin of resentment and also... the secret to healing it. Since Marina's father could not show compassion, it was up to her to find a way to transform her own inherited resentment into compassion. She did so by 1) choosing to have compassion for herself by recognizing and understanding the adversities she faced and sharing her experiences with another, and 2) deciding that she would "assume positive intent" when interacting with and thinking of others. Please share in the comments below if you know your parent or guardian's story about how they grew up? Did they also grow up facing adversity in childhood and struggle with resentment, perhaps handing it on to you as a right of passage? A detailed overview of the RESENTFUL LIE, as well as Marina's full story can be found in CHAPTER 3 ("Resentful to Compassionate") of INVINCIBLE: The 10 Lies You Learn Growing Up With Domestic Violence, and the Truths to Set You Free.